Guest contributor, Lana Hawkins from Smooth Decorator, took over the McKinley Beach blog this week to share some tantalizing interior design and decorating tips. If you want to give your home a completely new look and feel, the easiest and cheapest thing you can do is create an ‘open concept kitchen’. 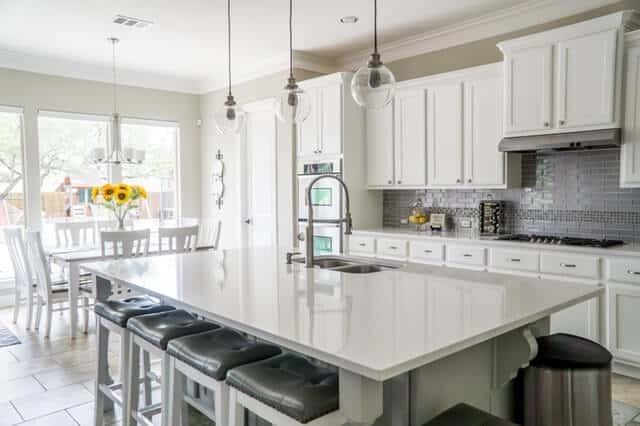 Opening up your kitchen to a dining room will give you a lot of new space and create a feeling of connectedness throughout your entire home. So, if you’re interested in the idea, here’s a little guide that will help you achieve the desired effect. Opening up your kitchen to a dining room doesn’t mean you have to join them completely. For the best effect, allow these two rooms to feel connected, but also remain defined without the use of constricting walls. One of the best ways to achieve good space definition between your kitchen and dining room is to use an island. Once you tear down the walls, you’ll have a lot of space for a practical island. It will give you extra space for food prep, cooking and even quick dining! Another way to define space is the use of different floor materials. A transition between tiles and laminate will clearly define different rooms while keeping them open! One of the best things about the whole open plan concept is the amount of light you’ll get. A well-lit space will automatically be more inviting and pleasant. 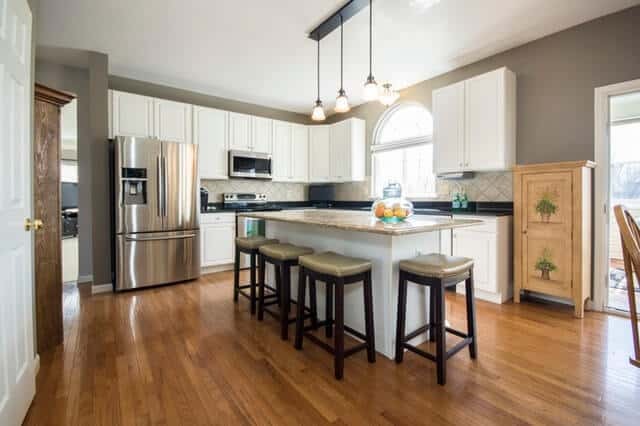 Luckily, an open kitchen allows you to take advantage of the exterior walls and add a few more windows that will simply shower your space with natural sunlight. With windows or French doors, you’ll open up your kitchen and dining area to the outdoors which will create an illusion of an even bigger space. Plus, you’ll have a nice view of your garden! If you love to cook all the time, you’ll release many pleasant and not so pleasant aromas into your open space! 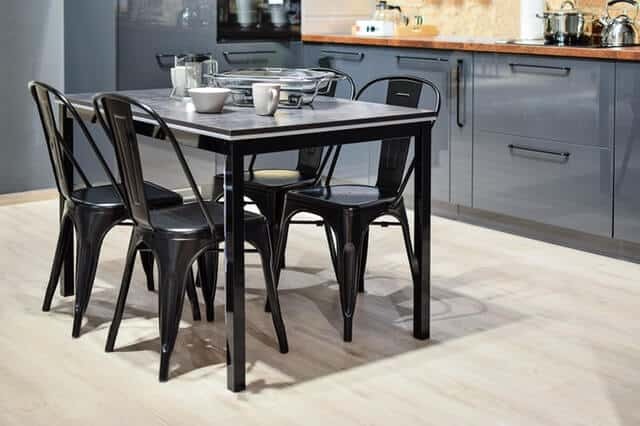 So, if you want to feel comfortable in your connected dining area, you must find a good way to keep your air odor-free. Luckily, all you need is a powerful Bosch island hood that will remove all cooking smells and steam in a blink of an eye. Plus, it will provide you with some extra task lighting, since it comes with built-in halogen lights! You might also want to invest some money in new appliances. If your old fridge and dishwasher create a lot of noise, it might pose as a huge distraction in the common area. However, modern appliances are very quiet and efficient, especially those with an Energy Star rating. Every well-designed open concept kitchen needs plenty of storage. It will allow you to achieve a clean and decluttered look that will make the entire space more pleasant and stylish. Aside from the traditional cabinets and drawers, you can also make use of your vertical space with a tall shelving system. Another great and chic idea is adding a larder. It will give you plenty of space to store canned and dried goods, condiments, and even less used kitchen gadgets and tableware. People who lack food prep space might also benefit from a small mobile worktop. It’s great for hiding away dishes and pots AND can serve as an extra space for chopping and peeling! While it’s important to keep your kitchen and your dining space defined, it doesn’t mean you must keep them completely separate design-wise. It will completely ruin the whole purpose of the open space kitchen! So, make sure to pick a few elements to integrate throughout both spaces to create a cohesive design. For instance, you can opt for a specific color palette and utilize it in the kitchen and dining area. Same colored trimmings, accents and decoration will create a nice flow and prevent the two spaces from competing with each other! Opening up your kitchen to the dining room is a great way to turn your kitchen from just a food prep area into the real heart of the household. It’s time to tear down some walls!